Quincy M.E. is an American crime drama that crosses over into the medical genre because the show focuses on the work of a medical examiner in the Los Angeles Coroner's Office. 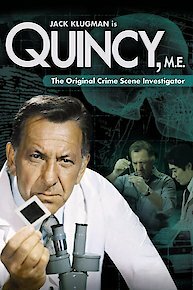 Created by prolific television producer Glen A. Larson with Lou Shaw the show features Jack Klugman as the character of Quincy, the first name of Quincy is never revealed in the run of the show. Quincy M.E. was a ratings success for America's NBC network during its seven season, 148 episode run from 1976 to 1983 that focused on the cases investigated by Quincy and touched on the private life of the Medical Examiner. Each episode of Quincy M.E. was based on a simple formula that was similar in each episode. Episodes begin with the death of a person that is quickly explained away by the police and medical authorities; Quincy does not accept the explanation given by the authorities and decides to investigate the death himself. During his investigations Quincy often faces opposition to his investigation into the death from members of the LAPD and his colleagues in the L.A. Coroner's Office. Quincy slowly begins to suspect a friend or family member of the deceased and then proves they are a murderer. Beginning its on air life as a series of made for TV movies Quincy M.E. was quickly successful and saw its run altered to a 60 minute format. In later series the focus of the show changed to explain more about the private life of Quincy and included episodes based on Quincy getting married and moving in with his new wife. The show also developed a social conscience that saw episodes begin to explain some of the major social issues of the late 1970s and early 1980s. Quincy M.E. was based on a number of different characters, including famous L.A. coroner Thomas Noguchi who featured regularly in news items during the 1970s. Jack Klugman, who portrayed Quincy was famous for his role in the TV version of The Odd Couple. An industrial accident causes a young father to lose an arm. When the arm is found, the man is brought to Experiment Hope, a top technological facility which has the ability to reattach a missing limb. The death of half of a famous entertainment team that Quincy used to admire as a youth, has him on a search to find the other half of the team. Quincy is determined to find the attacker of an old woman who was brutalized inside her own apartment. But things change when he is mugged on the way out one day, causing Quincy to suddenly fear being attacked again. When a young boy died who was living in a foster home, Quincy is asked to do an autopsy in hopes of finding enough proof to get the home closed down. In the meantime, a qualified therapist is asked to stay at the home and help fix any problems that may arise between the kids and the foster parents. A quiet honeymoon at a mountain resort proves anything but peaceful when a group of law enforcement officers arrive for their own vacation. The fun is short lived when a judge fails to show up and is found dead inside his car on a roadside. Quincy misses the wedding rehearsal while listening to the story from an old lady who claims she killed her husband. Emily cancels the wedding plans while Quincy tries to figure whether the old woman is telling the truth or just rambling on. While Quincy and Emily prepare for their upcoming nuptials, a body of a deceased old man comes into the morgue from a nursing home. The wife of the dead man informs Quincy that she is responsible for his passing. When a country singing star is badly burned in an accident inside a club, an investigator is convinced that the fire was caused by freebasing cocaine. The problem is there are no witnesses or friends who will testify that this is what happened. The police call in the help from a woman who claims to be a psychic, when their investigation for a man known as the "Hit and Run Killer" leads them nowhere. Although skeptical at first, Quincy is amazed when her predictions and findings materialize. A young girl disappears after entering a cab on her way home from school. A search for the missing teen reveals no clues, until a man appears, claiming that he is the cab driver and that he was attacked and removed from his cab. Sam is sucked into danger when his friend is killed while working undercover, infiltrating the Japanese Yakuza. Sam warns Quincy that his friend's father will likely follow the ancient code and exact revenge for his son's death. A hostage is shot dead by a policeman during a botched bank robbery and the cop enlists Quincy's help when he is suspended and possibly will face charges if it is proved that the shooting was his fault. Quincy believes and autopsy he just complete on a young man who died after a night of slam dancing at a punk rock club was directly attributed to the music the kids were listening to at the time. Lyrics about no hope, violence and death led to the man being stabbed in the back with an ice pick. Quincy is determined to find the killer of a murderer who was set free after a trial found him innocent. With the witnesses forced into lying, a group of men all claim that they killed the man in self defense, an excuse that Quincy doesn't agree with. Quincy tries to help out a fellow female medical examiner when she begins to screw up her job and make mistakes due to a drinking problem. When a young man dies after a routine heart surgery, his brother requests to have Quincy perform his autopsy. Quincy's findings makes him suspicious over who really performed the operation, the surgeon or his intern? A young member of an anti-gang group is arrested for the shooting death of teenage girl, but Quincy believes he is innocent and covering up for the real shooter. He needs to name the killer or be sent to prison. Quincy is called in to investigate the hazing death of a college student. After the young man died, his brothers moved his body in a panic to hide their guilt. When a pet German Shepard kills a young girl, Quincy goes into an investigation over why there are a limited set of rules concerning the training of dogs in the state. Quincy is caught in a game of espionage when a friend, Rear Admiral McKenzie, dies during the dedication of a Navy Museum, named after him. But while performing the autopsy, a Navy Commander requests the immediate release of his body, and Quincy discovers a microchip in the dead man's stomach. A dinner party finds Quincy and his boss Dr. Asten, at the home of Quincy's former high school sweetheart. He is weary of seeing her again because she was unstable the last time he had seen her, but appears normal now. The next morning finds that a top politician, Powell Dixon had died while at the house. An autopsy clears Jeannina, Quincy's former love, of any wrong doing. But when an explosion kills her too, Quincy knows that these cases may be murders. While Quincy is scheduled to be a witness in an appeals trial to keep a mob boss behind bars, the cases only witness is murdered. The mob next plan is to discredit Quincy, causing him to come up with a new set of evidence. When an agoraphobic woman takes a walk for the first time in years, with the help of her psychiatrist. While strolling she believes to have witnessed a strangling inside a neighbor's house. When investigated, the story seems to be just that...a story. But her doctor is positive she has seen a murder and needs Quincy's help to prove it before he loses her again to her condition. Quincy is called to investigate when a patient dies after receiving a pain injection from a nurse. The hospital blames the nurse and she is suspended immediately, causing a strike by the nursing staff. Quincy is asked to help when a female Vietnam vet is found dead. Her best friend, also a veteran of the war says they both suffer from post war depression and nightmares. Quincy investigates an oil refinery near a sanatorium after a man dies while jogging during a smog alert. His autopsy proves his lungs were filled with pollutants, believed to come from the refineries, and Quincy wants to prove it. Quincy investigates the claims that a young man killed his family after a voice inside his head, referred to as "the Beast," told him to do the crime. The schizophrenic says the voice talks to him when he is off his medication. Quincy is called in when a baby with Down Syndrome is allowed to die by starvation, and a doctor wants to know if the child's doctor was responsible so he can be charged with murder. Quincy is called in to help after an arsonist torches an hotel, killing a number of victims. But when the results show that most of the victims died from the smoke, Quincy disagrees about the suspects identity and goes all out to prove that his facts are correct. Quincy finds himself in a precarious situation when his girlfriend is called in to investigate foul play of a racehorse, which belongs to a close friend of the horse's owner, Nelson Spencer. Quincy makes it his business to track down a gun used in a murder when a man dies after a mugging in a park, followed by a young boy, both from the same gun. Quincy takes it upon himself to find out how to get look alike drugs made illegal by the government, after a teenager dies from taking these dangerous, yet legal pills. When a truck driver dies after a toxic chemical he was illegally dumping spills upon him, Quincy needs to find the site before the toxins get into the areas water system. Quincy meets with a doctor who specializes in teaching others how to handle grieving people after he is put in a situation of having to tell a family that their son, who already had a malignant tumor, died in a car crash. Quincy investigates when a wealthy property owner is viciously killed by his nephew, and then schemes to have his aunt sign over the ownership of the Institute of Equestrian Therapy, which helps crippled kids. Quincy and Nancy need to discover what the infectious disease is before a panic arises, since the area islands refuse the ship's request to dock with an unidentified disease on board. A murder of a crew member on a cruise ship interrupts Quincy and Janet's vacation, when he is asked by the captain for help. Although the killer is dead too, his autopsy shows that he died of an infectious disease. An car accident is used as an example of what great need there is to keep a trauma center open after a man who was seriously injured is sent there and survives while his daughter is sent to an ER and passes on. Quincy uses his influence to get more funding to hopefully save the center. A woman suffers from post traumatic amnesia after falling down an escalator at a student job fair. Just before her fall she was heard to shout out a warning that she was being chased, but no one knows who it is. But the answer may clear up when a would be assassin appears in her hospital room. Jack Klugman of "The Odd Couple" and "Quincy, M.E." passed away Christmas day.